These are fun to make, so get the children involved and decorate with icing and your favourite sweets. Place the icing sugar and butter in a large bowl and beat using an electric mixer. Gradually add the honey as you are beating the mixture, and beat until pale and creamy. Sift the flour, baking powder and cinnamon into a separate bowl and add the egg yolk. Stir in the butter mixture to create a dough. Remove the dough from the bowl and form into a ball on a lightly floured surface. Wrap in clingfilm and place in the fridge for at least 20 minutes. Roll the dough on a lightly-floured surface until it is 5mm in thickness and cut the shapes using a cookie cutter. Place them on the parchment-lined baking tray and bake for 12–14 minutes until lightly golden. Lightly beat the egg whites, and gradually add the icing sugar until a smooth paste has formed. 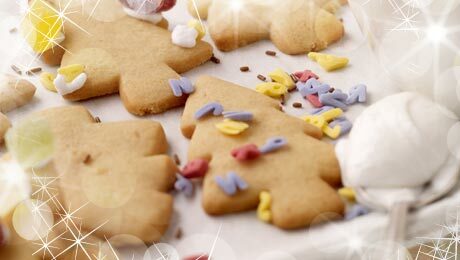 Ice the biscuits with the icing paste either by spreading it onto the biscuits with a spoon or by using a small piping bag. Decorate with sweets of your choice.